Participants from Georgia gather for a photo in between seminar sessions. With the influx of information that we read or listen to daily, an important 21st century skill is to be a critical information consumer of media and information. This necessary skill involves the ability to think critically about media and information, identify and analyze disinformation in the media, and review the credibility of sources. 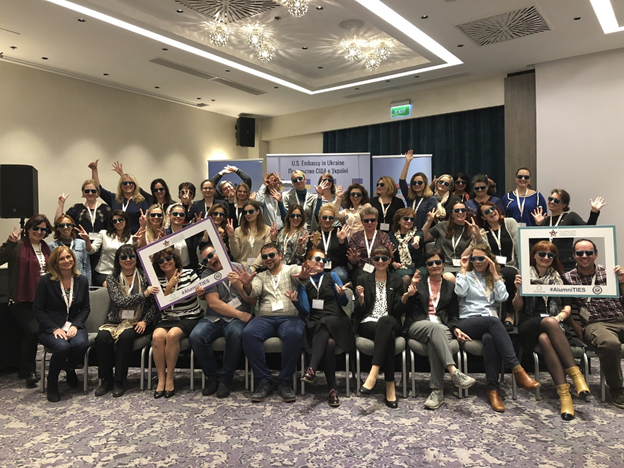 In late October, 43 U.S. government-sponsored international exchange alumni from 25 countries in Europe and Eurasia convened in Kyiv, Ukraine to discuss best practices and challenges to media literacy and critical thinking in their classrooms, libraries, and communities. The alumni participants were secondary school educators, librarians, and non-profit professionals, each one bringing their own unique personal and professional experiences to this Alumni Thematic International Exchange Seminar (Alumni TIES). This seminar coincided with UNESCO’s Global Media and Information Literacy Week. Participants from Ukraine and France gather for a photo after participating in an icebreaker during the Welcome Reception. Participants began the seminar with a networking event where they shared the challenges their communities have with media and information literacy. Through participant-led panel discussions and interactive breakout meetings, participants discussed several interrelated topics, such as applying critical literacy into the curricula, integrating digital communication, using technology responsibly, implementing information literacy programs for libraries, integrating media literacy into EFL and bilingual classrooms, digital literacy inclusion practices, engaging community stakeholders, and developing critical literacy projects for the classroom, library, or community. 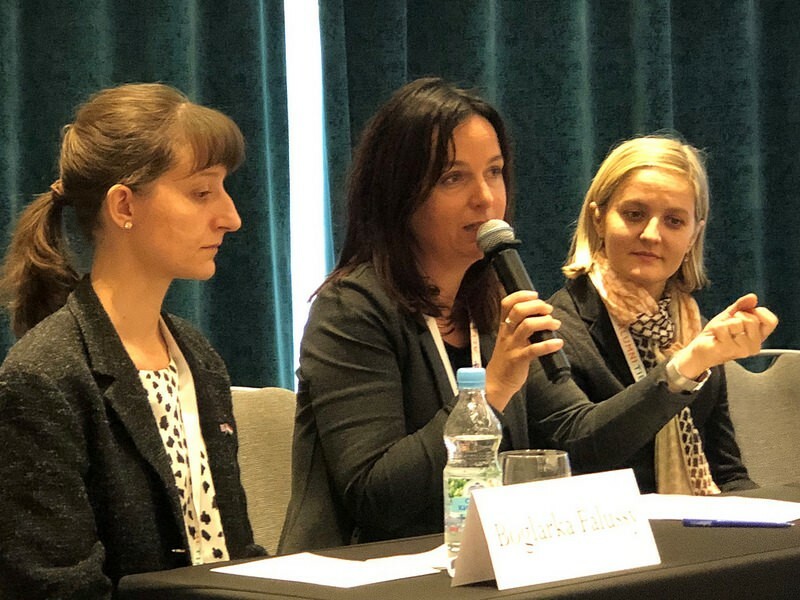 Participants from Hungary, France, and Bosnia and Herzegovina share strategies on how to increase digital citizenship in schools and communities. Participants spent one day at America House Kyiv, which is an American Space supported by the U.S. Department of State. 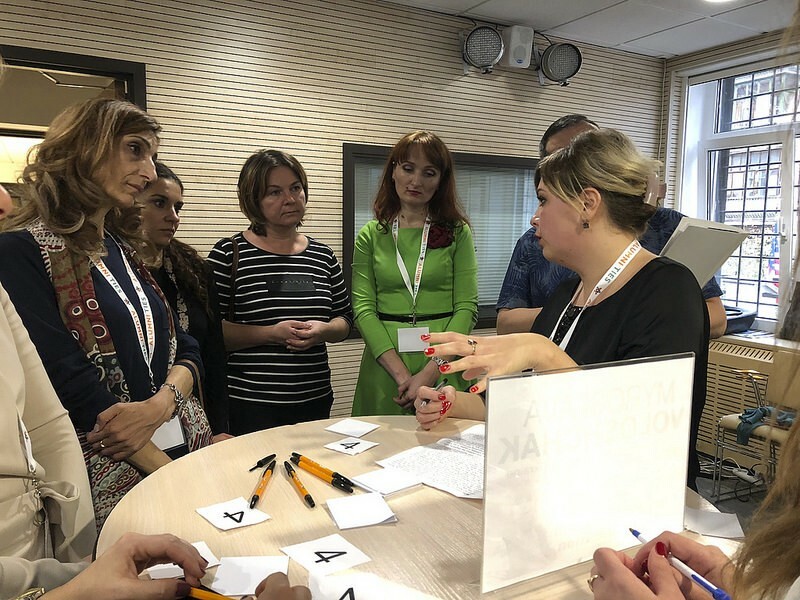 IREX Ukraine provided an overview of their Learn to Discern curriculum, with which participants engaged in interactive activities on how to be more discerning information consumers and how to identify and analyze disinformation in the media. Speakers from Internews Ukraine and StopFake demonstrated the practical tools they use to combat disinformation. After the presentations concluded, participants took part in a “Media Literacy Leadership Café.” During this interactive activity, participants met with Ukrainian journalists, teachers, and librarians who are helping people in their communities critically assess the media and information they consume. Participants learning from America House speakers during the Media Literacy Leadership Cafe. An essential part of every Alumni TIES is a session where participants brainstorm and plan their ideas for community-based projects. During the last day of the seminar, participants formed partnerships to develop projects to promote media and information literacy awareness, integrate different student learning communities in media and information literacy curriculum, and create teacher associations to empower educators with media and information literacy skills. 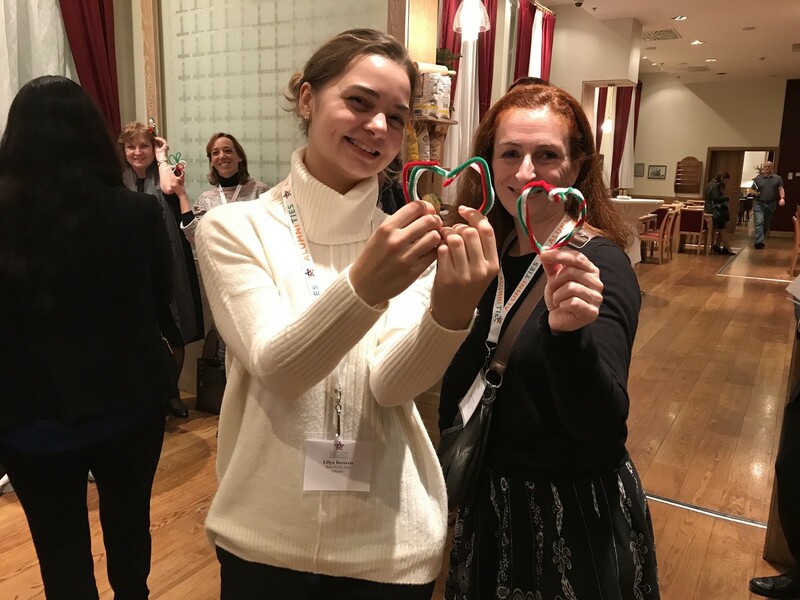 Merging their different experiences and local perspectives, alumni proposed projects addressing a wide range of needs in communities across Europe and Eurasia. This session provided a platform for participants to brainstorm and collaborate on potential projects that will be submitted to the Alumni TIES small grants competition, through which alumni can receive up to $5,000 USD to implement a community project. Alumni TIES participants plan to return to their communities and share the knowledge they gained from the seminar with their students, peers, local communities, classrooms, and libraries. 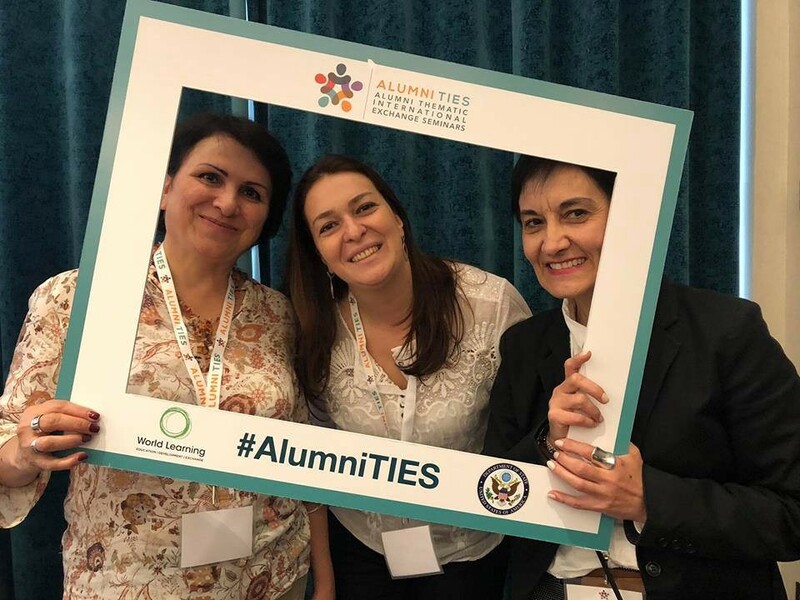 As participants begin executing their project plans, the World Learning Alumni TIES team looks forward to capturing the stories of successful alumni projects throughout 2018 and 2019!